Do I have to buy my textbook? 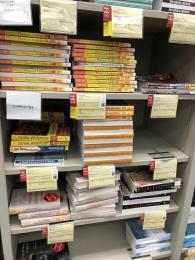 Thanks to the outstanding work of Access Services, students shopping at the campus bookstore can check to see if the Library carries their textbooks on reserve before making a purchase. Students will see a QR code attached to textbooks that the Library carries. Students can use their smartphone to scan the QR code to see a list of all of the textbooks available on reserve at the HSU Library. Textbooks on Reserve is a program that allows HSU students to borrow a textbook from the Library for two hours at a time. The students can complete the necessary reading and then return the book at no charge. This enables students to complete their assigned readings without encumbering expensive textbook costs. To see if your textbooks are on reserve at the Library, visit the Course Reserves page to see a list of the courses for which the Library carries the course materials.